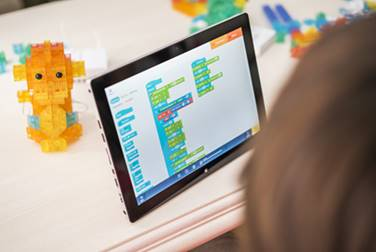 SAN DIEGO, Calif. — February 14, 2018—Sony Electronics today announced its unveiling of the KOOV Educator Kit, an all-in-one coding, robotics and design kit that combines digital coding with physical building to teach the next generation of problem solvers and innovators. Reflecting Sony’s commitment to both technology innovation and quality science, technology, engineering, art and math (STEAM) education, KOOV is designed to help cultivate students’ collaboration and problem solving skills, which have become critically important in 21st century learning. KOOV is made up of over 300 building blocks and accessories, along with a plethora of sensors, motors, LEDs and more. The KOOV Educator Kit includes the KOOV App, which features more than 30 hours of easy-to-follow educational content via its Learning Course. The KOOV Learning Course offers a great starting point for students to begin learning key concepts in coding, building and design. This educational course introduces the different electrical components that KOOV uses and provides students an overview of how those parts work and how to use Scratch-based coding to control them. The KOOV Educator Kit also comes with 23 pre-designed, pre-coded “Robot Recipes” ranging from simple structures to complex animals and vehicles. These recipes enable students to start building right away and quickly develop the skills needed to create their own original robots. The Robot Recipes showcase what can be done with KOOV, giving young learners the inspiration they need to move ahead and make their own unique creations from scratch. About Sony Electronics Inc. Sony Electronics is a subsidiary of Sony Corporation of America and an affiliate of Sony Corporation (Japan), one of the most comprehensive entertainment companies in the world, with a portfolio that encompasses electronics, music, motion pictures, mobile, gaming and financial services. Headquartered in San Diego, California, Sony Electronics is a leader in electronics for the consumer and professional markets. Operations include research and development, engineering, sales, marketing, distribution and customer service. Sony Electronics creates products that innovate and inspire generations, such as the award-winning Alpha Interchangeable Lens Cameras and revolutionary high-resolution audio products. Sony is also a leading manufacturer of end-to-end solutions from 4K professional broadcast and A/V equipment to industry leading 4K Ultra HD TVs. Visit http://www.sony.com/news for more information. Dieser Eintrag wurde veröffentlicht in English, General, Hardware, Programming, STEM und verschlagwortet mit KOOV, Sony, STEAM, STEM von Sebastian Trella. Permanenter Link zum Eintrag.